As promised, the La Cense Beef Truck debuted in midtown last week, and according to various reports, a publicist was on hand to help bloggers skip the line so they wouldn’t complain about the wait. But that didn’t exactly make them fall in love with the burgers. Here are the early evaluations. The six ounce burgers are served medium, but basically end up medium well. This would have been a tragedy if it hadn't been for the saving grace of the soft and sweet grilled onions (which come with every order) and the gooey cheese ($0.50). Sneaking a bite of the patty minus the cheese and onions, it was kind of dry. If the truck's purpose is to highlight the boutique La Cense beef brand, it fails with its overcooked patty. Even a blend designed by renown chef and pit master Adam Perry Lang consisting of trimmings from loin, sirloin, chuck, and round can't save a slightly dry burger. However, the nice soft bun was a veritable sesame seed explosion and perfectly encased the burger. Overall, this burger was just fine, but given the hype I expected more. Granted, it is only their first day, so it'll probably improve in the days to come. it’s an excellent burger, but currently being slightly overcooked and undersalted. It’s a coarse grind and has some nice beef flavor, grassy rather than sweet, but it doesn’t really… pop… One problem though is that the burger didn’t have a strong brown on it; I suspect it was flipped too often, or that the griddle needs heat. The bottom line, though, is that it’s the best burger that’s ever been in a truck. 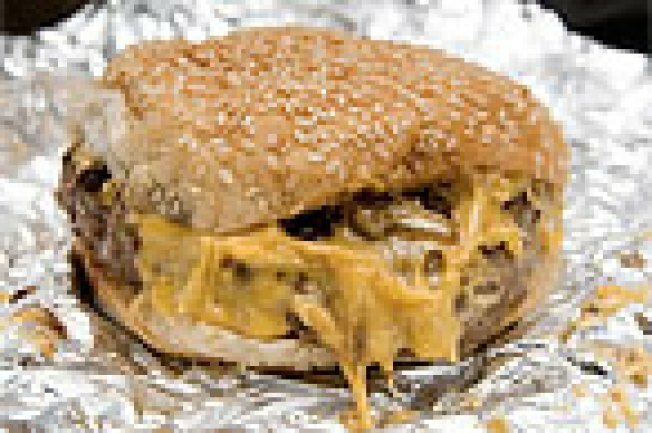 I just finished the burger and while it’s certainly no LaFrieda juicy flavor bomb, it has a nice taste, and the combination of the melted cheese and onions definitely catapults it up a notch. I actually found the beef to be a bit underwhelming and a tad bland, perhaps because I only ever order my burgers medium rare. Any Grub Street readers go for the burger?